While Bill (Caraher) blogged a bit on Punk Archaeology and PKAP today, in a separate but related sphere (parallel trajectories I call them), I stumbled across an audio-video short that David Pettegrew recorded during the PKAP 2012 field season in Cyprus. I uploaded this to my YouTube channel, and I will share it here. In May and June of 2012, the Pyla-Koutsopetria Archaeological Project (Dr. William Caraher, Dr. David Pettegrew, and Dr. R. Scott Moore) charged me with trench supervisor duties for an excavation unit located outside of Larnaca, Cyprus. Here in Pettegrew’s video is a wall emerging out of the excavation unit from a 3rd-century BCE Hellenistic coastal fortification. This site is contemporaneous with Alexander the Great and Zeno, the Stoic from Citium. Within the excavation unit, I am to the right, and sorting out the stratigraphic layers with a student and colleague. The student and colleague to my left continues uncovering bedrock at an industrial pace. What it looks like when for the first time attempting to gchat an unconference talk from Cyprus in the eastern Mediterranean to Fargo, North Dakota. This last Friday the board of the North Dakota Humanities Council met for a regular meeting, and after a solid morning’s work (sweat on everyone’s brow, of course), we thought we would experiment at lunch with an attempt to beam Ancient Historian Bill Caraher (his blog here) from the Levant/Cyprus (for context, Cyprus is approximately 140 miles from the coast of Syria) into our meeting room at the Ramada in Fargo, North Dakota (for context, Fargo, North Dakota is 140 miles from Bemidji, Minnesota), this to give a short talk on some modern archaeology of man camps in western North Dakota (stay with me here). Of course, before any idea becomes a reality, experimentation has to happen (this is where I start to explain what went wrong). Remember: all those polished talks are the result of a lot of experimentation and planning. In our case, the talk was cut short due to lack of band-with. While I’m uncertain what the band-with strength was like in Cyprus, I can say that on the Fargo Ramada conference room end of things it was dodgy — at best. Your audio cuts in and out. You sound like a droid. And the power points aren’t synching on our end. Other than that, everything is great. 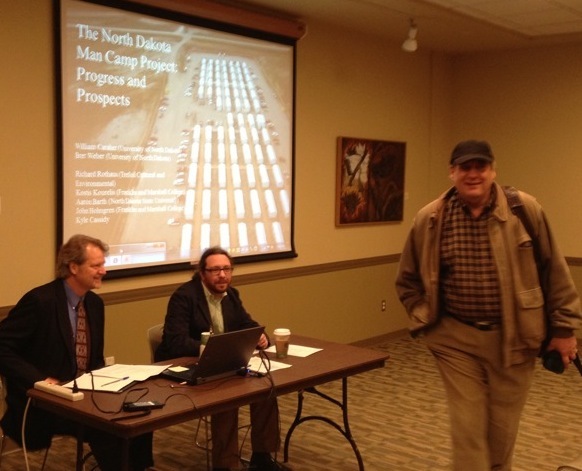 Bret Weber and Bill Caraher prepare to present man camp findings to NDSU in the Spring of 2013. Tom Isern pictured at right saunters back to take a seat. This coming Friday the board of the North Dakota Humanities Council (or humanities council, however one prefers) will convene for one of its regular meetings. The council meets every three or four months in various locations throughout the state to conduct the business of a board. A primary function of these meetings is to consider a variety of outstanding proposal submissions. In addition to this, and at this Friday’s meeting, we will officially or unofficially welcome aboard — the board — some new members. One of these new members is Bill Caraher, a crack Ohio State University-trained jet-setting ancient and modern historian and archaeologist with University of North Dakota’s prestigious department of history. Bill is also a Punk Archaeologist without borders, much like our friend and colleague Andrew Reinhard. 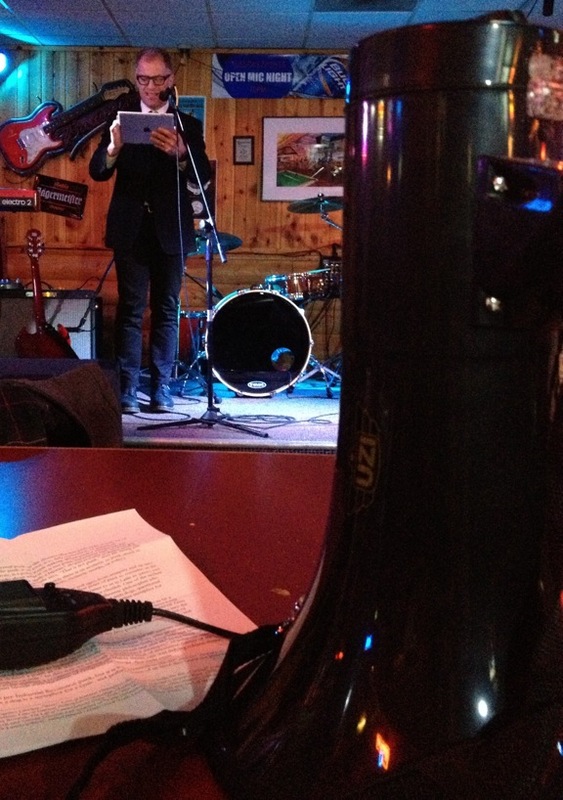 Dr. Kostis Kourelis, punk archaeologist and art historian with Franklin and Marshall College (Pennsylvania), gives his thoughts on punk archaeology through a PA after being introduced with a bullhorn. an e-mail to Bill this morning, letting him know the technology I’ll bring to the NDHC board meeting so that we can pull a kind of joint half-hour presentation off in good order. Doing something like this is akin to playing in a band. Professors and teachers: encourage your students to start or join bands. Here are some analogies between the two: there is the processes of research and preparation (or what a band calls making songs and then rehearsing those songs), locating the technology to transmit that research (the band refers to this as instruments, including voice, guitars, harmonicas, drums, banjos, cymbals, sound boards, timpani, PAs, speakers, cow-bell[s], monitors, lights), finding the specific meeting room and location and coordinating with the executive director (this is what a band calls finding a venue, and “chatting with a bar owner”), and then executing the entire thing within the span of 30 minutes (this is what a band calls a “set”). Doing this over and over and over again, too, ensures that researchers and lecturers (or individual band members) will simply refine the process and get better and better. Another note: while we can digitally bridge the spatial gap between the northern Steppe of North America and the eastern Mediterranean, there is little we can do about the temporal gap: it’s not that big of deal, though, since when it is noon Central Standard Time in eastern North Dakota, it is roughly 20:00 hours in Greeco-Levantine time (or about 8:00pm). This will be fun. Long live modern archaeology, the digital humanities, and punk. Some modern archaeology of a punk archaeology set. 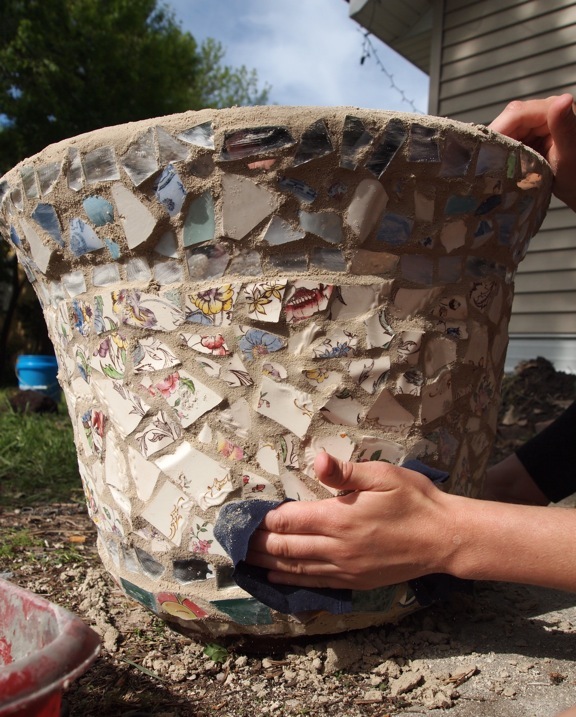 Molly is finalizing the mosaic grouting process on a reused terra-cotta potter salvaged from someone’s trash pile. It is the weekend and projects are happening: plans have been set in motion to slow-smoke some baby back ribs, and Molly is out front of her sister’s Valley City home, toiling away at a mosaic project. I’ve busied myself with reading James Belich, The Victorian Interpretation of Racial Conflict: The Maori, The British, and the New Zealand Wars (McGill-Queen’s University Press, 1986 & 1989), but have set it down to do a bit of immediate chores. So without slamming out any more dialog (we are packing up and readying to go, which is timely to end this short entry), I will upload a couple pictures I snapped a year ago in Kourion, and a couple pictures from today in Valley City. Taking massive leaps through space and time, this is what I call a global and local longue durée of mosaic history, from Kourion, the Roman Empire, to Valley City, North Dakota. 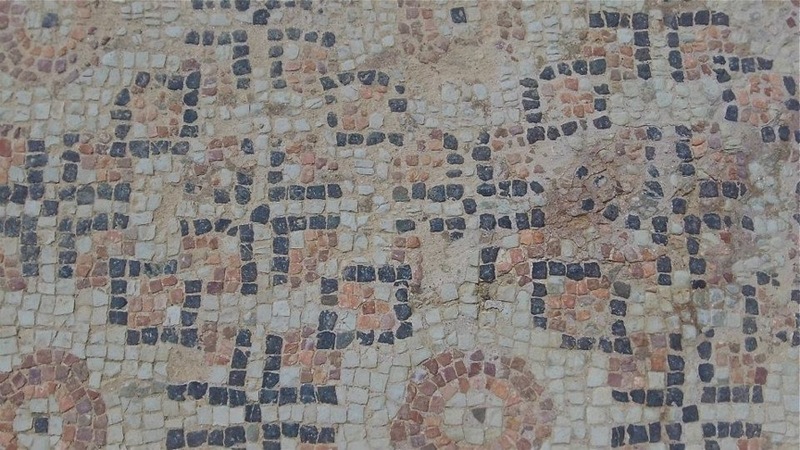 Close-up mosaic detail from Kourion, Cyprus. 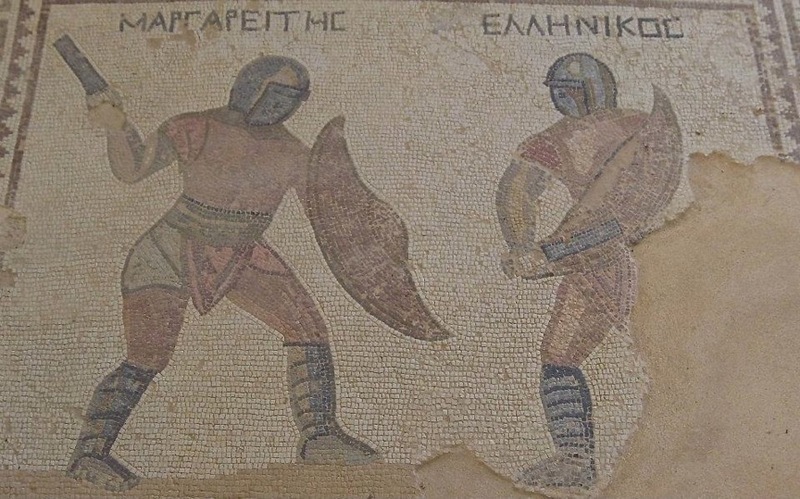 A mosaic from a Roman gladiator’s home in Kourion, Cyprus. Mosaics are not for cowards. This evening, while bracing for full throttle summer and the planting that goes with it, I prepped one huge planter (it took on three of those huge bags of dirt) adjacent to the patio. Before dumping in the dirt, and for reasons that will never be made clear to me, the word “drainage” bounced through my brain. So instead of just dumping in the dirt (and dooming a plant to drown), I looked about and gathered up some small cobbles (way larger than what in the archaeology business we call a Size Grade 1). I dumped what small rocks I could find into the planter, but it was a smattering and did not seem enough. So I looked around, and found a — or, if you prefer, an — historic archaeological solution: smash up the already busted up pottery, some terra-cotta, and put the sherds into the huge planter as foundation for drainage. Last week, Molly and I salvaged these sherds while trolling up and down the streets, eyeing the curbsides during the annual, city-wide dispose-of-anything-and-everything day. 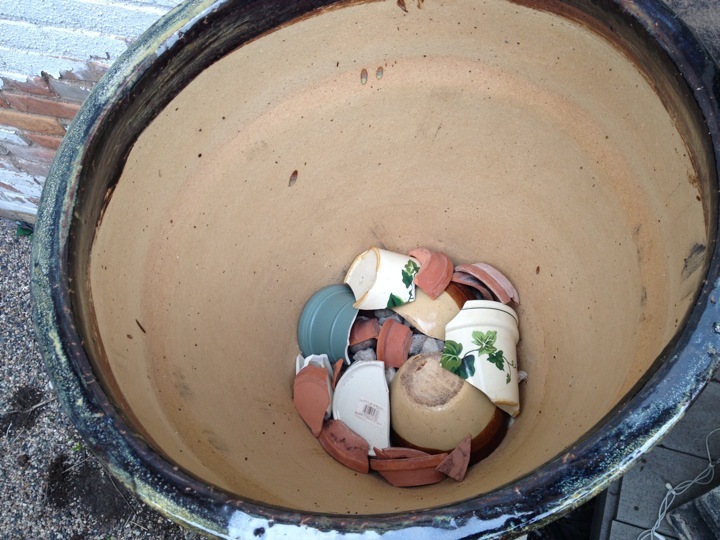 As I was situating the sherds in the bottom of the huge pot, I also thought about excavating northern Great Plains, North American midden mounds and Hellenistic garbage piles in the eastern Mediterranean Levant. Ancient and prehistoric pottery is everywhere, and more often than not, ceramics and pottery uncovered by archaeologists today has, throughout the course of its own life, undergone a series of adaptive reuses: the artifacts we uncover today have been recycled for a long time, by disparate cultures and for different reasons. In using my archaeological imagination, I also couldn’t help but thinking how Ancient Romans and Hellenistic Cypriots, and Ancient Mandan-Hidatsa, would have used busted pottery for a variety of purposes, either as backfill, drainage for planters, and so on. An aside: there is something soothing about the noise of used terra-cotta bases smashing against a brick wall. 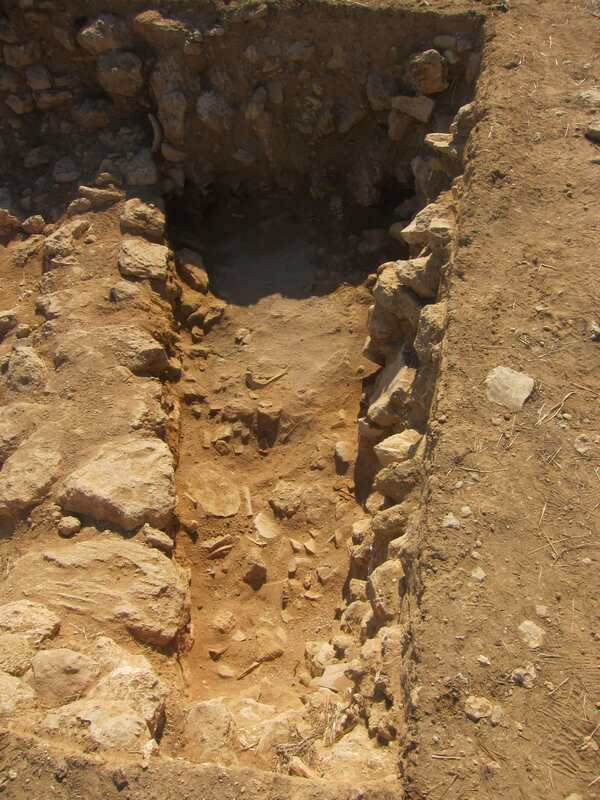 To the right is a photo of an excavation unit from the PKAP archaeological dig of May-June 2012 on Cyprus. At the bottom of the deepest strata, you can see the terra-cotta back fill emerging from a 3rd-century BC Hellenistic site. Subjective data collection is different in draft form from what is ultimately presented as a finalized product. 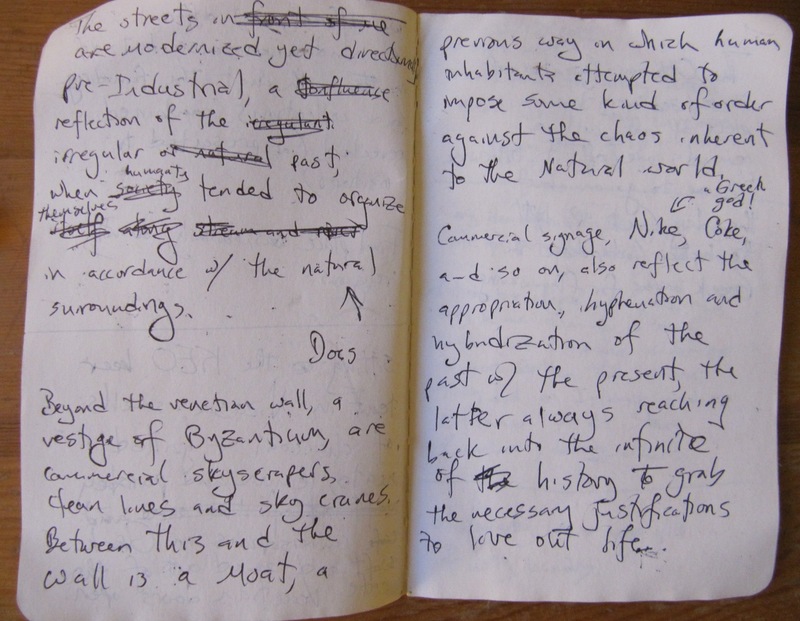 Just last evening, while sitting on my futon in the living room (at the time, Iron Man 2 was for some reason streaming through on the AppleTV), I began flipping through the notes I had jotted down while in Nicosia, Cyprus, on May 18, 2012. When these notes were scribbled down, little thought was given to how they would be viewed in the near future. But last night there the notes were, igniting in my memory thoughts that had otherwise gone dormant, and also the process by which these immediate thoughts are set down, and what they look like in rough form. Here is a page of notes, scribbled down with pen while sitting at a KEO beer tent, taking in some regular sounds of the city. Raw notes taken down at a KEO beer tent in Nicosia, Cyprus (eastern Mediterranean) on May 18, 2012. Sometimes it’s important to not try and slam the day full with one consecutive tourist attraction after another. Knowing what a place is like often requires us to find a corner cafe or some sidewalk seating, sit down, not worry about a time-table or schedule, and simply observe what is going on around us for a good hour or so. Or more. I often have to remind myself of that. On June 5, 2012, my Pyla-Koutsopetria Archaeological Project excavation team hit glorious bedrock (something just over or around 1.8 meters below ground surface). Here is what happens when you sink a hand pick into clay and hit said bedrock. Reverberations shoot up and in through the handle, up to the hand, all while simultaneously returning audible reverberations produced by said metal pick striking bedrock (also known as “that sturdy clink”). The ear drum will pick this up and trigger cognition in a certain direction. It will induce a New World northern Great Plains’ers’ eyes to widen. Note: if you are privy to Native America and its history (and you always should be), you will arguably not regard yourself as from the New World (in academia, we sometimes refer to this as post-colonialism). However, when you are in the Mediterranean, you will need to somehow communicate differences from one side of the Atlantic to another. “Damn that Columbus.” Say this while smiling. If you carry Scandinavian historical identity with you, remind Columbus fanatics about this Smithsonian web-link. We all need balance. Anyhow, and upon hearing this bedrock clink, thank the archaeological comrade to your immediate east. “Thank you for also hitting bedrock.” Then pull the pick up out of the earth, swivel the handle 180 degrees, grip it again, and bring back the right arm to its physiological apex. When at its entire apex swing downward, coordinating the arm with gravity to aim the scraper end where the pick left off. Note: you will hear a similar clink and feel the handle vibrate again. With the pick lodged in the dirt and resting on the bedrock below, extend the free left arm toward the upended pick, enclose the left hand around the topside of it, and then drag the handle toward yourself with your right while pushing down on the backside with your left. Essentially, pull the scraper in to the body. Do this repeatedly, moving across the horizontal stratigraphy, only stopping to wipe the sweat from the brow (it otherwise will get into your eyes and produce a slight sting in the corners). This, in turn, will ultimately induce northern Great Plains and Old World historic and archaeological comparative thoughts. No matter the location on the planet, archaeological excavation units are essentially closed quarter laboratories, where theory and data are in constant exchange with one-another. There is the material culture that continuously emerges from below, inanimate objects from a bygone age (note: do not ever, ever, refer to skeletal remains as “inanimate objects.” You will deservedly be destroyed by the present). These objects carry and reflect the imprint of humanity. Know them. Respect them. They are from civilizations and cultures that pushed in certain directions for an infinite amount of reasons. While in the excavation unit, thoughts will continue, at least when bounced off the word culture (this word and idea re-popularized by Fernand Braudelin the 20th century). This latter word, culture, is analogous with the word cult (and even agriculture, and monoculture), or the process of doing things together and in a particular direction. These are some thoughts that will rip through your brain. In addition to this, your archaeological physiology will be in constant exchange with meteorology and the weather. This may be reflected in the saying, “If you can’t stand the heat, then get out of the excavation unit.” You will be uncertain how warm it has been getting at the Vigla site on Cyprus — “What does this Centigrade mean? And why can’t the world just get on board with Fahrenheit? What does it all mean? !” Never mind all of these thoughts. Keep them to yourself. If you know the sun is going to be up and about, definitely wear a brimmed hat (sombreros have been suggested), collars if you can, sunscreen for certain. If your shirt is in its second day of rotation, you may take offense at your own odor about mid-afternoon of that second day. It’s okay to announce this to your crew. Be calm in your tone, though. “I am taking offense at my own body odor. I just wanted to announce that.” In the correct context, all of this will lighten things up a bit. As mentioned above, excavation units can become cramped. But this doesn’t matter because you’ll have kept the bigger idea and picture in mind. The mind convinces the body that an inevitability is at stake: we will finish this excavation unit, record it properly, and be satisfied with questions we answered, and the new questions generated by the unanticipated finds — happens every time.